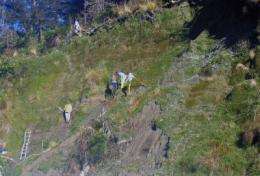 University of Nevada, Reno seismologist Glenn Biasi and colleagues at GNS Science in New Zealand dig into layers of silt along the Hokuri River in New Zealand’s Southern Alps on the South Island to find ancient samples of leaves, small twigs and marsh plants for radiocarbon dating. The team established that the Alpine Fault causes, on average, earthquakes of around a magnitude 8 every 330 years. They estimate the 50-year probability of a large Alpine fault earthquake to be about 27 percent. Credit: Photo courtesy University of Nevada, Reno. A new study published in the prestigious journal Science, co-authored by University of Nevada, Reno's Glenn Biasi and colleagues at GNS Science in New Zealand, finds that very large earthquakes have been occurring relatively regularly on the Alpine Fault along the southwest coastline of New Zealand for at least 8,000 years. The Alpine Fault is the most hazardous fault on the South Island of New Zealand, and about 80 miles northwest of the South Island's main city of Christchurch. The team developed evidence for 22 earthquakes at the Hokuri Creek site, which, with two additional from nearby, led to the longest continuous earthquake record in the world for a major plate boundary fault. The team established that the Alpine Fault causes, on average, earthquakes of around a magnitude 8 every 330 years. Previous data put the intervals at about 485 years. Relative motion of Australian and Pacific plates across the Alpine Fault averages almost an inch per year. This motion builds up, and then is released suddenly in large earthquakes. The 530-mile-long fault is among the longest, straightest and fastest moving plate boundary faults in the world. More than 23 feet of potential slip has accumulated in the 295 years since the most recent event in A.D. 1717. Biasi, working with the GNS Science team led by Kelvin Berryman, used paleoseismology to extend the known seismic record from 1000 years ago to 8,000 years ago. They estimated earthquake dates by combining radiocarbon dating leaves, small twigs and marsh plants with geologic and other field techniques. "Our study sheds new light on the frequency and size of earthquakes on the Alpine Fault. Earthquakes have been relatively periodic, suggesting that this may be a more general property of simple plate boundary faults worldwide," Biasi, of the Nevada Seismological Laboratory said. "By comparison, large earthquakes on California's San Andreas Fault have been less regular in size and timing." "Knowing the average rate of earthquakes is useful, but is only part of the seismic hazard equation," he said. "If they are random in time, then the hazard does not depend on how long it has been since the most recent event. Alpine Fault earthquakes are more regular in their timing, allowing us to use the time since the last earthquake to adjust the hazard estimate. We estimate the 50-year probability of a large Alpine fault earthquake to be about 27 percent." A magnitude 7.1 earthquake centered near Christchurch, the largest city in the South Island of New Zealand, caused extensive damage to buildings on Sept. 2, 2010, and no deaths. On Feb. 22, 2011, a triggered aftershock measuring magnitude 6.3, with one of the strongest ground motions ever recorded worldwide in an urban area, struck the city killing 185 people.